The native populations lived along Hickory Creek in long houses constructed of tree limbs and wattle. Even today the careful seeker can find arrowheads and other stone tools of these Native Americans. Tall grass prairies and clusters of hickory, birch, oak and maple trees were left relatively undisturbed by these tribes, despite the evidence that they hunted, trapped and fished as well as planted small amounts of corn and used indigenous clay to make pots and reeds to make baskets. 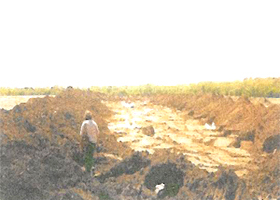 When the New Lenox Park District golf course was being built on Marley Road, work was stopped to allow for archeological work at the site. Remains and artifacts were found dating from the Late Woodland (400-1000 A.D.), the Mississippian (1000-1600 A.D.), and the Proto-Historic (1600-1673 A.D.) Periods. The skeletons were reburied in Oklahoma by Miami from that state. The golf course was given the name Sanctuary in honor of the Native American discoveries on the site. 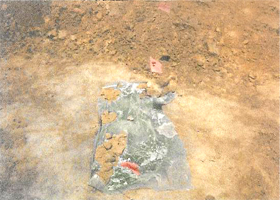 Excavation work was extensive as these two photographs indicate. Tribes living in the area had varied for some time because of the displacement of tribes in the east moving west The settlers who arrived in the 1830s found friendly natives of the Pottawatomie tribe. 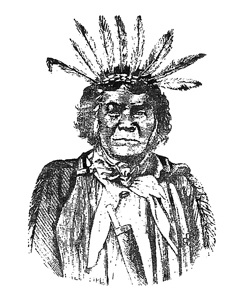 Their chief Shabbona often visited at Gougar Crossing, preferring to sleep on the floor while his wife slept in the bed. At Gougar Crossing an Indian burial site was marked by the traditional pole with white feather attached. By 1832 at the conclusion of the Blackhawk War the Indians had moved west of the Mississippi River. An artist’s conception of Shabbona, published by the Will County Historical Society.